Thorough, careful editing can make an enormous difference to the quality of your writing and the success of your manuscript. These days, publishing houses will only consider polished, professionally edited manuscripts. You have to put your best foot forward. Hiring a Sparks Editor prior to submitting your manuscript is a smart investment—in your work and yourself. Not only will editing enhance the text itself, working with our professional editors will strengthen a writer’s skills immeasurably. Substantive editing—the entire manuscript is reviewed to ensure that the integrity of the content, as well as its structure, is impeccable. Substantive editing looks at the big picture—the entirety of your work—and addresses issues of continuity, understandability, and believability. Stylistic Editing—where language is polished, jargon is eliminated, and meaning is clarified line-by-line. 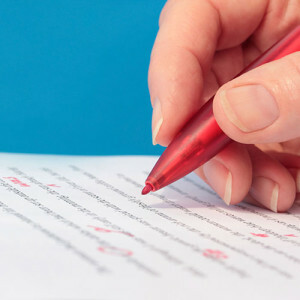 Copy editing—concentrates on accuracy, formatting, spelling, grammar, syntax, and structure corrections throughout the manuscript. Copy editing is perfect for the well-written manuscript that’s almost ready to be seen by the world, but just needs a bit of finessing first. Proofreading—this is the most basic, yet meticulous, editing process. Proofreading lends a professional eye to a strong manuscript that may have occasional spelling or grammatical typos. Line by line, the editor will review the manuscript and point out any infelicities in the text. How will an edit alter your carefully crafted manuscript? How much will it cost? We will perform a free sample edit of five pages (see our Fees Page for proper formatting guidelines), including a projected estimate of what the costs are likely to be. If you find those five pages to be enhanced and improved, a full edit can commence.